Julia’s stitching on this piece is perfectly stunning! The canvas is 22” x 11” and is filled with lots of beautiful threads, stitches and distinctive techniques, some from the 17th century. Non-refundable deposit of $350 required to register. Balance of $840 due on first day of class or it can be divided into 4 payments. Call 313-886-2828 to set up a payment plan. There will be preparatory work to do on the background before class begins. You will receive the canvas, necessary threads and instructions several weeks in advance. Cancellation Policy: Registration fees are not refundable and cannot be transferred to another class. Any canvas, threads, stretcher bars or supplies purchased for the class are subject to our normal return policy, unless they were specially ordered just for the class. Canvas, threads, stretcher bars or supplies purchased specifically for this project class are not refundable within six weeks of the first day of class. Materials Included: Bring your scissors and favorite tools. Requirements: There will be some preparatory stitching on the background to be done in advance of class. You will receive the necessary materials several weeks in advance. Instructor Bio: Julia Snyder grew up in her local needlepoint store where her mother, Patsye Hardin, worked. She started stitching at the age of 4 and has not stopped since. Julia has won awards in the State Fair of Texas as well as ANG. 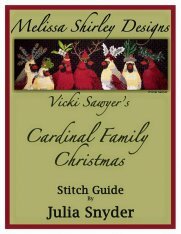 She has also designed and taught classes for ANG, EGA, Needlepointers, Destination Dallas Market, and TNNA Market. Julia has also been involved in judging at the State Fair of Texas for several years and been a part of the Beaux-Arts Auction at the Dallas Museum of Art. She has been teaching for the past 22 years, since she and her mother opened Key Stitches, which closed in 2009.